In just one month the biggest country of Europe, Germany, is going to the polls. In this short tutorial, I text mine the main parties' election manifestos in order to visualise the state of German politics. What themes preoccupy German politics? I do not know a single human being who reads election manifestos. In order to nonetheless get a feeling for what they talk about, I text mined the current German general election manifestos. The general result is summarised in the above word cloud showing which party dominates which word. Words are sized by how often they occur across election manifestos and coloured according to the manifesto where they occur the most. The colours will be familiar to most readers but just in case I included party names as well. The word clouds for each political party reveal different themes. I plot the top 100 words of each manifesto and scale the words by how often they occur. The ruling conservative parties CDU/CSU of chancelor Merkel appear to focus on Germany (deutschland) and to a lesser extent Europe (europa). Otherwise, community related words (menschen, unser, unserer) are noticeable. 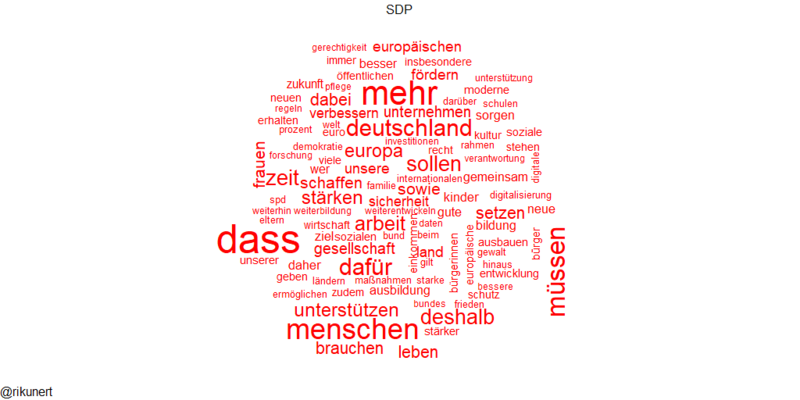 The other ruling party, the social democratic SPD, appear to fail to find a strong verbal focus, instead opting to talk more or less equally about Germany (deutschland) and Europe (europa). The relatively low frequency of social justice (Gerechtigkeit) is noticeable given that the SPD tried to make this the theme of this election. The currently biggest opposition party, the far left DIE LINKE, talk about ‘having to do something’ (müssen) and human beings (menschen) more than other parties. However, they failed the competition for promising ‘more’ (mehr) to the social democrats. Otherwise, welfare state vocubulary appears quite common (solidarische, sozial(en), pflege, arbeit). 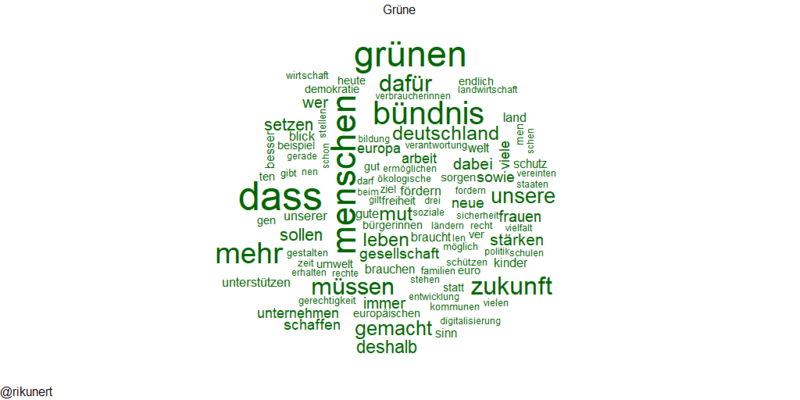 People (menschen), the future (zukunft), and Germany (deutschland), seem to be the most common words for the greens. 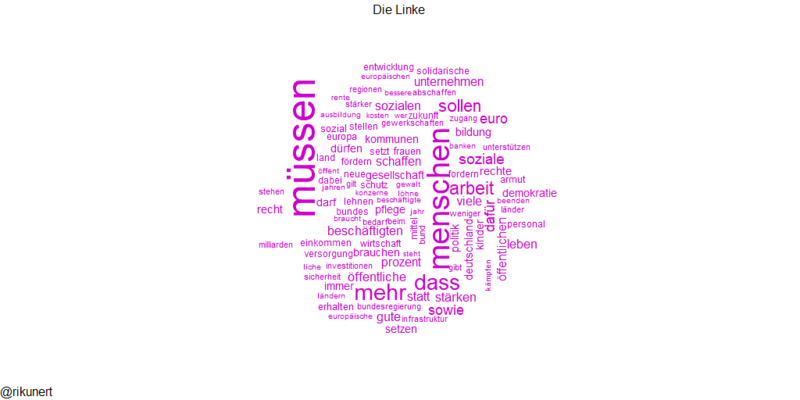 Surprisingly, environment related words (ökologische) hardly make it into the top 100 words displayed in the word cloud. The pro-business liberal FDP is likely to join the federal parliament again after a four year hiatus. Expectedly, they use business vocabulary a lot (leistungen, unternehmen, wirthschaft, wettbewerb). 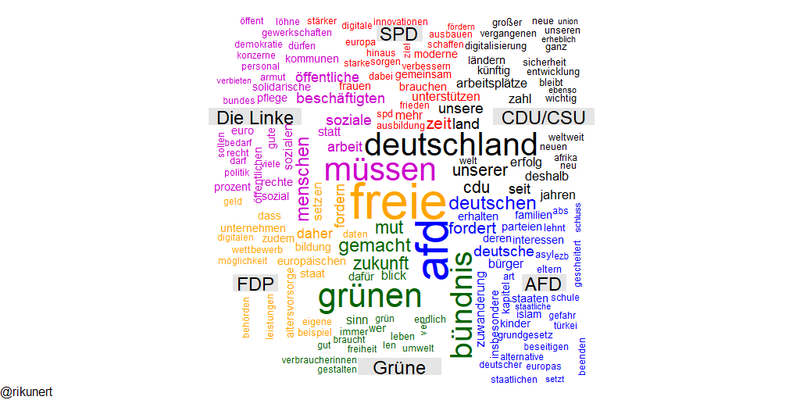 Perhaps in an attempt to come across as a modern party a lot of computer vocabulary is included as well (digitalisierung, digitalen, daten). The right populist AFD are widely expected to enter the federal parliament for the first time this autumn. Their excitement about this prospect appears to be mirrored in the frequent mention of ‘general election’ (bundestagswahl). They unexpectedly lose the competition to mention Germany (deutschland) the most to Merkel’s CDU/CSU. 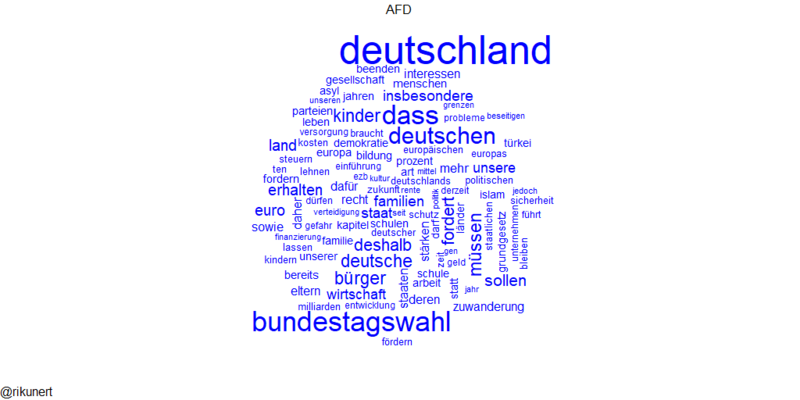 Notice that vocabulary related to foreigners coming to Germany makes it into their word cloud (asyl, islam, zuwanderung, türkei). As an aside, a certain Martin Schweinberger did a similar project for the last German general election published on his blog. 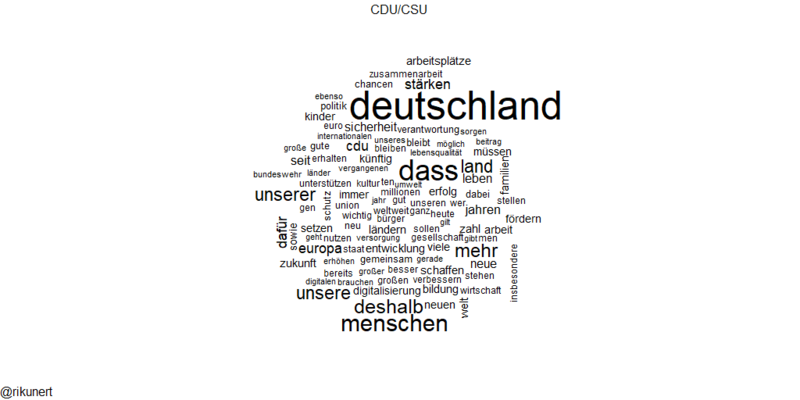 Compare his word cloud to mine and see how the German political discourse has changed. 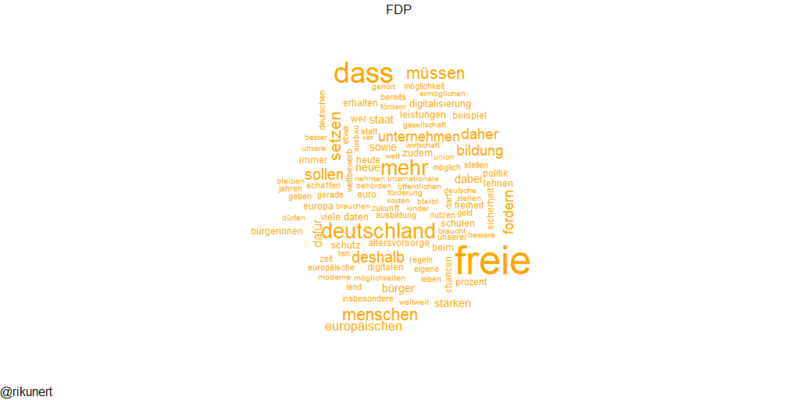 For example, four years ago Germany (deutschland) was mentioned a lot less and the liberal FDP dominated that word. A far cry from the situation in 2017. In the following, I show how you can make these plots from the comfort of your own home. The full script can be found on github. We start off by acquiring the election manifestos directly from the party websites. We put the urls in maifestos_pdf and then loop through them using sapply. sapply uses a nameless function defined on the spot. That function prepares a location dest in the tmp folder where the manifestos will be stored. It then downloads the manifesto of this loop iteration and uses pdftotext.exe (which you should download before) in order to turn the pdf into a txt file whose name is returned by the function through its last statement. These txt files allow us to do some text mining with the R library tm. Given the variable length of the manifestos, we don’t want to give a party an advantage for just writing a lot. So, we adjust word frequencies by how many words are in the document using the prop.table() function. This is also a good moment to get proper column headers saved in party_names. And that’s it in terms of data preparation. We can start plotting using the wordcloud package. The first plot showing which party dominates which word uses traditional party colours defined in party_colours and the comparison_cloud() function. Note that the maximum word count is not per party but instead for the whole plot. We add the caption into the margin using R’s mtext() function. Side 1 is the bottom and lines are counted from the inside out. The party specific word clouds follow the same principle. However, in order to plot all words, the word size had to be reduced through the scale parameter. I added a title using R’s mtext() function to unambiguously show which party is meant.